Schematic diagram of model used to examine the role of NHE in ischemia-reperfusion injury. Shaded regions indicated components that are regulated by pH and/or phosphometabolites. Ischemia-reperfusion (IR) injury occurs when ischemic tissue experiences a restoration of normal tissue perfusion. IR injury can lead to dangerous arrhythmias such as ventricular tachycardia and fibrillation, that may be even worse than if ischemia were allowed to continue. At a cellular level the depletion of oxygen leads to anaerobic metabolism, and ultimately acidosis. Cells attempt to decrease the internal H+ concentration using the sodium-proton exchanger (NHE), exporting protons and importing sodium. This, unfortunately, leads to a build up of Na+ inside the cell, which in turn leads to many more complications, and ultimately the arrhythmias mentioned above. One natural approach to the treatment of IR injury is the inhibition of NHE. NHE inhibition, however, has had little beneficial effect in the clinical setting. By incorporating NHE into a computational model of a ventricular cardiomyocyte (Roberts-Christini Model), we were able to elucidate the mechanism behind this surprising clinical finding. Furthermore, the model suggested that any therapy which prolongs intracellular acidosis may also be problematic. “NHE Inhibition Does Not Improve Na+ or Ca2+Overload During Reperfusion: Using Modeling to Illuminate the Mechanisms Underlying a Therapeutic Failure,” PLoS Comput Biol, 7(10): e1002241 (2011). This is a good example of the way that computational modeling can be used to understand a complex pathological state, and make predictions that are clinically useful. Computational cellular modeling is a good tool for attacking these problems. 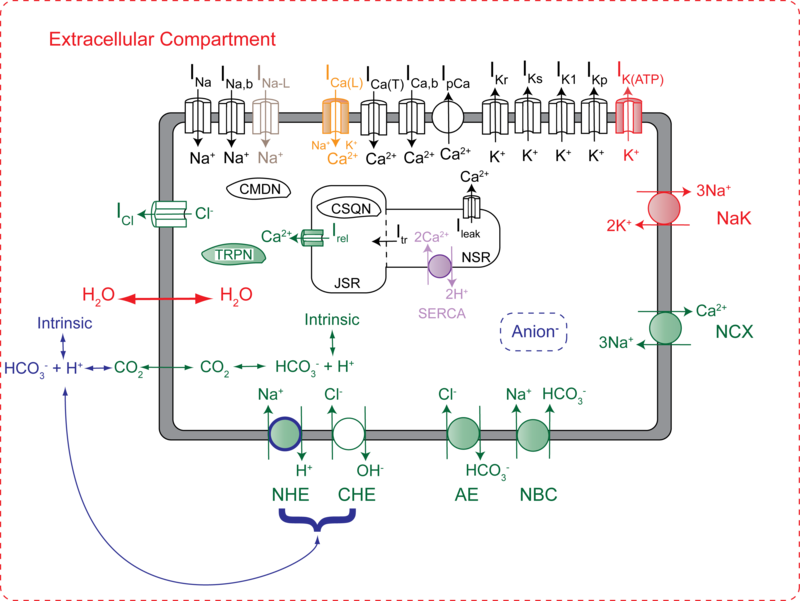 The ways in which changes in certain ion channels will affect the entire organ can often be difficult to determine due to the complex, nonlinear nature of the biological system. Similarly, the cause or mechanism of a particular pathology may be difficult or even impossible to tease apart using only experimental techniques. Modeling gives us complete control over the experimental setting and all cellular properties, allowing us to test hypotheses and make predictions that would not be otherwise possible. We are currently refining our computational models to address issues like subcellular alternans and the consequences of the upregulation of NHE in aging animals. Additionally, we can couple many cellular models together to create models of the whole organ. At the moment, we are focusing the effect of ionic and structural remodeling resulting from atrial fibrillation in a 3D model of the human atria.